About 20km north of Treviso (as the crow flies) in the vicinity of the small town of Nervesa della Battaglia there is is found the interesting Osteria ai Pioppi nestled amongst the trees of a small forest and it lies way off the tourist trail. In the summer months there are no walls, it is open to any breeze that may temper the seasonal heat. It's fare is rustic and the wine is served in earthenware jugs. If you prefer white tablecloths, waiter service and fancy Michelin star meals then this won't be for you but you would miss a great experience. This is a place that local people frequent for good, honest, authentic food. The menu is displayed on large overhead boards and you wait in a queue until your number is called to collect your meal. 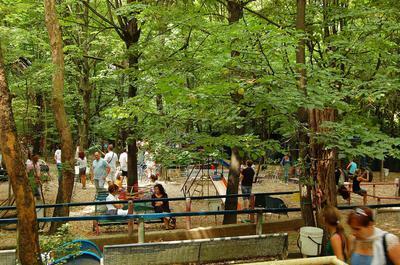 However, this isn't any ordinary osteria for, wander around the back and you will find an amazing adult size playground with all rides human powered by participants. 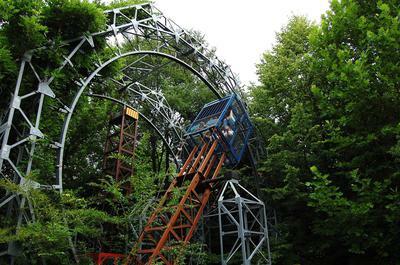 Apparently it has been built over the past 40 years by the owner and the word that springs to mind on seeing it is 'wacky'. Did I use it? No I didn't! Good though my lunch was I decided that I didn't want to see it again so soon after consumption. Instead we made our way to the gentle waters of the Piave river nearby and cooled our feet whilst observing the iridescent damsel flies flitting around. This was, to me, the perfect way to spend a day surrounded by local people, no English spoken, no tourist menu and certainly no crowds following a raised umbrella! 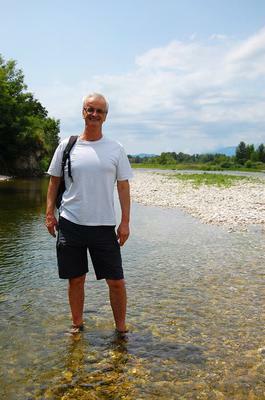 Excuse my indulgence of including myself paddling in the Piave! Maria's reply: I know this park well and absolutely love it. 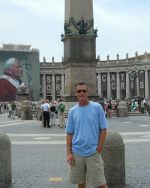 I'd actually forgotten about it as it is a while since I was last there and you brought back a lot of happy memories. Thank you for that Pete. Join in and write your own page! It's easy to do. How? Simply click here to return to Share Your Secrets.